A shop worker has died after being stabbed in Sunderland. Police were called to the One Stop Shop on Sea Road at about 22:40 BST on Wednesday, where they found 62-year-old Joan Hoggett with serious injuries. She was taken to hospital, but pronounced dead a short time later. A major search of the surrounding area in under way. Northumbria Police said a 19-year-old man was later arrested on suspicion of murder and remains in custody. Officers said the arrested man was not local. Forensic officers in white suits centred their inquiries on the shop, which is at the centre of a 300m long cordoned-off parade in Fulwell. Side streets and two nearby parks were also taped off as police with dogs conducted a detailed search of the area. Supt Paul Milner, of Northumbria Police, said: "We believe this to be an isolated incident with no wider risk to the public. 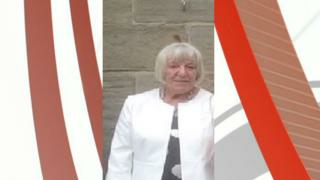 One man has been arrested in connection with Joan's murder and is assisting police with their inquiries. "A number of cordons remain in place, and as a result, I would like to thank residents and local businesses for their patience and cooperation. A One Stop spokesperson said: "We are shocked and saddened by the incident, our thoughts and deepest sympathies go out to our colleague's family and friends at this difficult time. "We are currently supporting all colleagues involved and assisting police with their inquiries." Residents in the area paid tribute to Ms Hoggett. Derek Campbell said: "I have lived in the street for eight years. She's a nice lady, helpful, like all of them in that shop." Shakeel Rahman, who works in a mobile phone shop nearby, added: "She was nice and polite. "She only served me two days before. It is such a shame." Samantha Willis said: "I burst into tears when I heard. She was a lovely lady, very sweet."